The wait is over for highly respected trainer John Sadler, but he wasn't all that interested in talking about winning his first Breeders' Cup race after years of trying. Zero for 44 tries was a thing of the past, and Sadler wants to leave it there. Instead, he was talkin' horses. 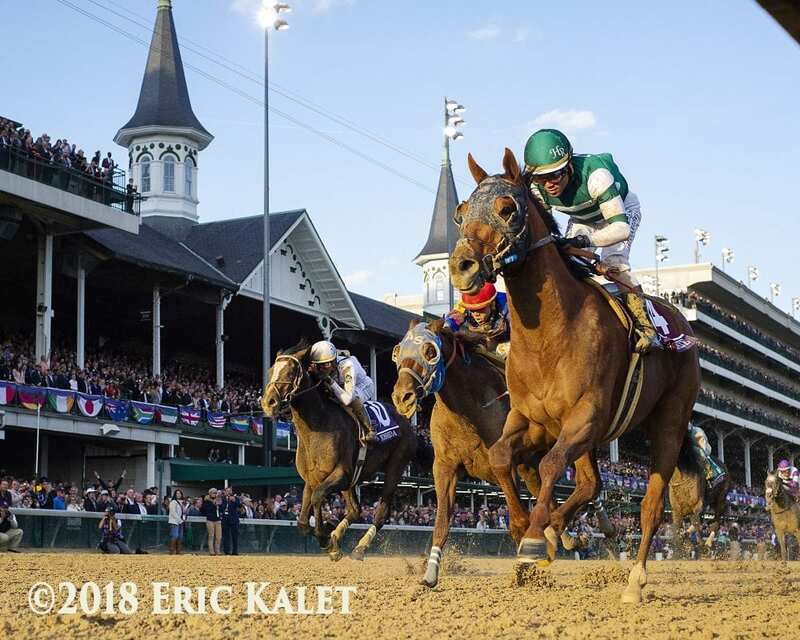 And, though his Classic champion Accelerate was the centerpiece of the day-after morning, he covered all the ground about the ground his four Breeders' Cup prospects covered during Saturday's closing day of the Breeders' Cup weekend. As for what the future holds for 5-year-old Accelerate, he was scheduled to be vanned to Lane's End Farm where he'll get some “R & R” and be shown to prospective breeders as a future stallion. Following his screen test, Sadler said, Accelerate will be returned to the trainer's Southern California barn to be prepared for what figures to be his final race before going to stud – the $9 million Pegasus World Cup at Florida's Gulfstream Park Jan. 26. While Accelerate brought Sadler a rosy outlook on Saturday, there were some thorns. Chief among that category was the off-the-board finish by highly regard Catalina Cruiser in the Dirt Mile as the favorite. “We'll get him home to California and give him a full vetting and see what's going on. That was a disappointing run for him yesterday, but the plan is to campaign him at five (in 2019) and you'll see better of him going forward. Sadler said the filly appeared fine Sunday morning. She goes into the Fasig-Tipton November sale in Lexington Sunday night. She could return to Sadler if she doesn't make her sale price, the trainer said. Sadler beamed while talking about Catapult's runner-up finish in the Mile. “We're really proud of him. It was a very good second. He handled the yielding turf really well. He's been a really good horse. He won two nice stakes at Del Mar and he got beat by Sir Michael Stoute [Expert Eye] so that puts him in good company. He'll probably run next in the $7 million Pegasus Turf (Jan. 26). Sadler, who saddled his first Breeders' Cup starter in 1988 at Churchill Downs, earned his victory in the World Championships with Accelerate who was his 45th starter. “It feels great, but as a trainer you are always looking ahead,” Sadler said. “There are a lot of ups and downs in this game and yesterday got off to a bumpy start (with Selcourt finishing 12th in the Filly & Mare Sprint). Accompanying Selcourt to Lexington was Hronis Racing's Shenandoah Queen, who finished fourth in the Chilukki Saturday in the race after Accelerate's Classic victory. She is scheduled to be sold at Keeneland on Monday. This entry was posted in Breeders' Cup and tagged accelerate, Breeders' Cup, breeders' cup classic, catalina cruiser, catapult, churchill downs, john sadler, lane's end farm, pegasus world cup, selcourt by Press Release. Bookmark the permalink.